I had the opportunity to interview David Ebsworth, author of The Assassin’s Mark, a story about battlefield tourism, allegiances, and the Spanish Civil War. Click here for my review. You do an incredible job of bringing the buildings and landscapes to life. Have you visited any of the places in the book? Great question! And yes, I was lucky enough to visit all those locations for real. While I was writing Assassins, we had an old motor home – a small one, not one of your huge American RVs – so we headed to the French border, then crossed over into Spain at Irún and followed the route taken by the group of tourists featured in the story on their 14-seater 1930s yellow Dodge school bus. All the old roads are still there. Upgraded, of course, but still more or less following their original narrow winding paths through the Basque country and then west into Asturias and Galicia. Much of the landscape is still the same too. Perhaps most remarkably, I managed to find hotels that were operating in 1938 and are still open. Spain is a great country. Very civilised, modern and vibrant. But they take a huge pride in preserving the old. So you can see places like Hondarribia, for instance, close to San Sebastián, not only as it looked in the 1930s, but actually as it looked two hundred years before that. Or you can go to Compostela and see the unusual Pilgrim’s Mass each day at noon, exactly as it’s always been performed for those who’ve walked the Camino de Santiago. So hopefully that all made it easier to bring those places to life on the page and thanks for your lovely comment. Funnily enough, I heard from an American couple, a few months ago, who’d taken Assassins with them when they visited Northern Spain and used it while they were there, following both the route and the story as they went. How neat is that! 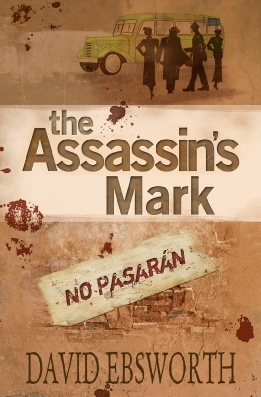 The Assassin’s Mark takes place in Spain during the Spanish Civil War. Why did you pick this particular war? It’s always interested me. I worked with men who’d fought in Spain as volunteers. They’d viewed the rise of Hitler and Mussolini with horror in the 1930s. So when Spanish General Franco launched a fascist military coup in his own country, in 1936, and sparked the civil war, they and 32,000 others like them enlisted alongside the people of Spain not only to try and stop Franco himself, but to stop the rise of the Nazis across Europe as a whole. Those International Brigade members came from all over the world, including huge numbers from the United States who formed their own battalion – and they still have a very active association, the Abraham Lincoln Brigade Archives (http://storeybookreviews.com/) to keep the memory of the volunteers alive. We have a similar organisation in Britain and their work is important. The governments of the world basically stood by and watched while Hitler and Mussolini sent huge quantities of planes and soldiers to help Franco. And while Russia sent aid to the democratically elected Spanish Republic, this was on a much smaller scale. In reality, Germany and Italy used the Spanish Civil War to practise for the Second World War, and historians argue strongly that, if Hitler and Mussolini could have been stopped in Spain, the Second World War might have been prevented. It’s no coincidence at all that World War Two started in 1939, almost immediately after Franco was eventually victorious earlier in the same year. So I guess I wanted to write a novel that might remind us about some of those things. From my research I have found that battlefield tours during the Spanish Civil War actually took place. How did you research the tours and did you draw from accounts of people who participated at the time? I was looking for a way to tell the story of the conflict’s background in a way that would grab people. This was supposed to be entertaining, after all, not a text book. So while I was doing some research about the International Brigades, I came across some work done by Professor Sandie Holguin from the University of Oklahoma. Sandie had unearthed copies of the tourist brochures advertising these tours and had written an academic paper on the subject. Franco, it seemed, was so certain of winning the war that, in 1938, while the outcome was still in the balance, he had set up an alternative government which, astonishingly, included a Tourism Department. Then, as a propaganda exercise, he produced these brochures and circulated them to all the travel agencies of Europe and beyond. The first tour, to the battlefields of Northern Spain, took place on 1st July 1938 and they continued, with around 80 tours each year, until 1945. It’s estimated that they attracted perhaps 20,000 international travellers, mostly from Europe but some from as far away as Australia. And they were all, of course, treated to a warped Francoist version of what the war had all been about. Sandie’s paper then led me on to other source materials – the account of a group of Italian journalists among others – and these provided lots more details, for example, about the hotels used by the tours, the food they ate, the sort of vehicles. So I used all that stuff in the story. One of the characters, Brendan, is skilled at turning conversations to his own favor in a way that I have never encountered before. Was the political rhetoric difficult to write or something that comes naturally to you? Ah, you must have led a sheltered life, Allison! As you say, this is a fairly standard trait among politicians, and I’ve worked with a lot of politicians in my time. That’s not to be critical of them. Most of the politicians I’ve known have been genuinely good people committed to public service. But it can be hard and thankless work, and even the best of them need their own defence mechanisms – so turning conversations to their own advantage is pretty much a stock-in-trade. I hope that my own background helps me write “political” stuff, but I was also helped here, specifically, because Brendan Murphy is based on a couple of real people. There were volunteers like Brendan (thankfully not too many) who also went to fight in Spain – but for the “other side”. Basically people who supported Franco. And some of them later wrote about their own experiences. So I was able to borrow lots of their views on what it was all about. They make interesting reading. With the benefit of hindsight, there’s no longer much argument about what actually happened in Spain, although it can still sometimes be a touchy subject in Spain itself. Yet, at the time, people like Brendan on the one hand, and Jack Telford on the other, would have had entirely different interpretations of what was going on, and each would have believed implicitly in their respective version. That’s the fascinating thing about history, eh? It’s often in the eye of the beholder. The tour group is made up of an eclectic mix of people. Are any of them based on historical figures that participated in the original tours? Spanish Civil War propaganda poster (Photo courtesy SpanishCivilWarPosters.com) Click for full details. Not specifically. Though there were certainly “types” of people who went on the tours and I tried to reflect these a bit. So, for example, we conveniently forget now just how many people in Britain during the 1930s were themselves Nazi supporters. So we had Sir Oswald Mosley and his Blackshirt thugs, the British Union of Fascists; people who helped organise the pro-Hitler Anglo-German Fellowship; the families of those volunteers who’d gone to fight for Franco and died in Spain; staunch Catholics who saw the Civil War, in Franco’s terms, as a Holy Crusade between the Catholic Church and the “Reds”; the many monarchist supporters of our very own pro-Nazi royals, Edward and Mrs Simpson; and those who simply love to tour battlefields (it’s an interesting fact that trips to the First World War battlefields have never been so popular as they were during the 1930s). Then I threw in Music Hall comedian Max Weston as a bit of “light relief”. The nuns too, of course – though, even here, I was astonished to discover that a very similar religious order did, in fact, send nuns on pilgrimages of their own, with bouquets of flowers, for Hitler and Mussolini and Franco. The Assassin’s Mark seamlessly blends history and fiction so that the reader can enjoy the book without having a background in the Spanish Civil War. Was it hard to step back and write so that the average reader can understand the background that sets up the storyline? Yes, very hard. If it’s a subject about which you feel passionate, it’s difficult not to fall into lecturing mode. And there’s a lot of mostly unfamiliar history to cope with here. Hopefully, I managed it OK. But, if it’s any indication, you may like to know that when I’d finished the first draft, the word count came to 170,000 words and I had to cut that down to 150,000. The entire 20,000-word missing sections were all “history” bits. I hated doing that, but the balance would have been completely wrong if I’d not changed it. But hey, thanks for the questions and I’m happy to answer anybody’s comments. Well, tomorrow the Virtual Book Tour for The Assassin’s Mark moves south to Texas, so you can find out more about David Ebsworth then, at Storeybook Reviews. And if anybody’s interested in receiving Dave’s monthly e-newsletter, you can contact him through the comments below, or though his website (click here for his most recent newsletter: ), or by e-mail at: [email protected].